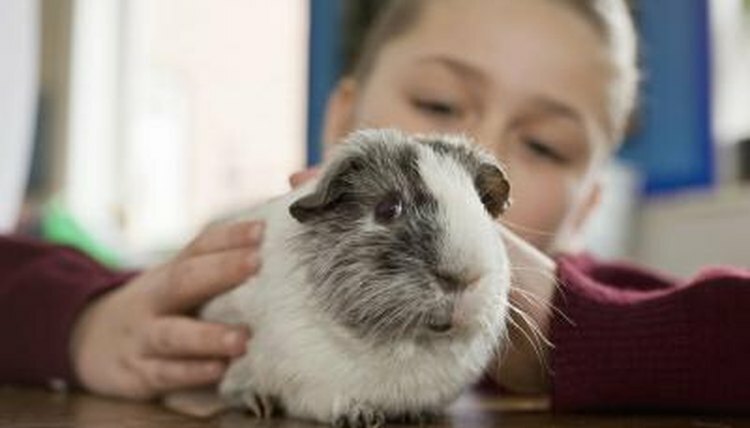 Guinea pigs need exercise every day to stay healthy and burn off energy, and a playpen is the safest way to let your furry friend frolic. Store-bought playpens are often too small for piggies, but you can build your own simple, sturdy playpen and let your piggies play to their heart’s content. Clear a space on the floor for your playpen. This should be a minimum of 42 inches wide and 56 inches long to accommodate your playpen, but give yourself a little more space to allow for movement around the pen. Lay the fleece fabric over the playpen space. Many guinea pigs are potty trained, but will go outside their litter box if they get excited. The fleece helps protect your floors and gives your piggy a soft surface on which to play. Place a panel connector on the lower right corner of one storage cube panel, and attach another panel to the right of the first. Slip another connector on the right side of the second panel, and attach one more panel to the right of the first two. This creates one of the 42-inch-long end panels for your playpen. Create another of these end panels, and set them both aside. Connect four panels together to form the left side of your playpen, and connect the remaining four panels together to make the right side. Set the panels on top of the fleece, and arrange them to form a large rectangle. Add connectors at each of the four corners to hold the panels secure. Insert panel clips at every joint along the top of the playpen to reinforce the panels and prevent your piggies from pushing them over and making a break for it. Pull the edges of the fleece up along the sides of the panels, and clip it to the wire with clothespins. This forms a barrier around the edge of the panels to hold waste and debris in place as your pigs frolic and play.  Purchase wire storage cube panels at your local home improvement store.  Wash your fleece between play sessions to cut down on staining and stubborn odors.